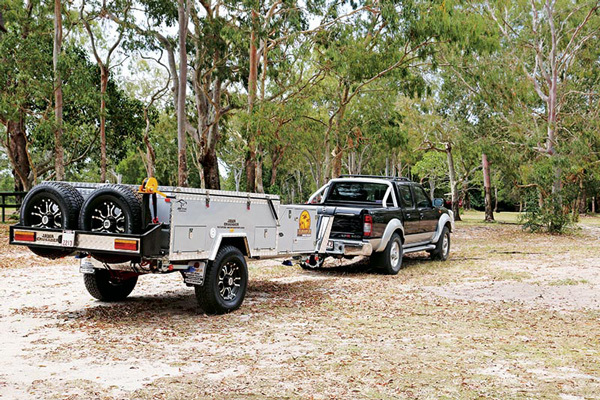 Jawa Offroad Camper Trailers sells a wide range of camper trailers – side-fold softfloor, forward-fold and rear-fold hardfloor – so, generally speaking, its campers can cater for a variety of needs. 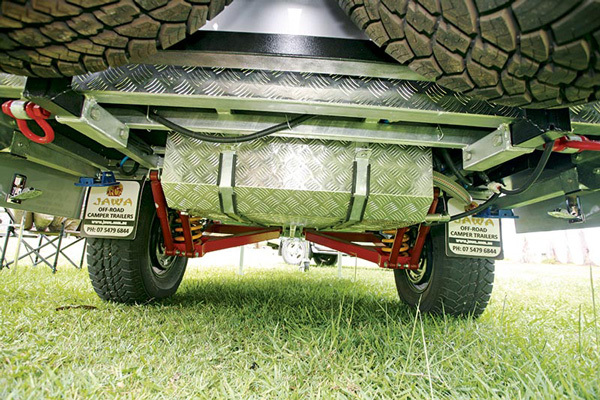 The components of the Jawa trailers are built in China but much of the fit out is done locally at Jawa’s Sunshine Coast, Qld, premises. For this review, I decided to take a look at one of Jawa’s forward-fold models, the Cruzader, and yes, that’s with a ‘z’ and not an ‘s’! It comes with an extensive standard fittings list and a few nice options. 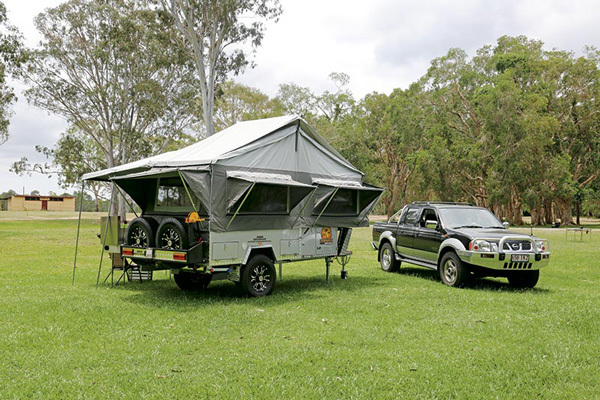 Being a forward-fold camper trailer, the Cruzader has a simple but effective layout. When opened up, the entire upper front creates the bedroom, while the rear contains a low club lounge. 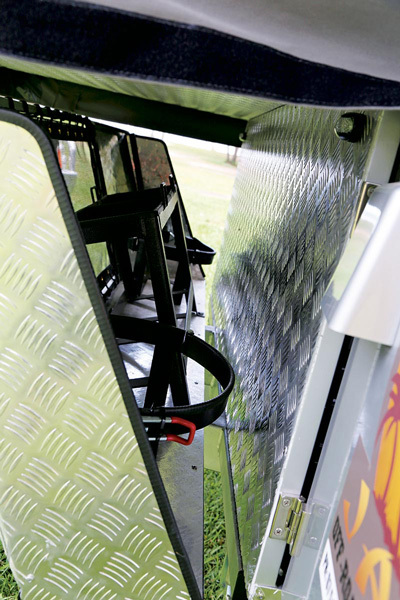 The slide-out kitchen is fitted to the rear of the trailer and the large box on the drawbar contains, among other things, a fridge tray on sliding rails providing an open area in which to cook. The tent walls and roof all seem to be well sewn together. Jawa uses a 16oz canvas that is double stitched. Weatherproofing seems to be well in hand with features such as seam tape on the roof to reduce the possibility of water leaks. 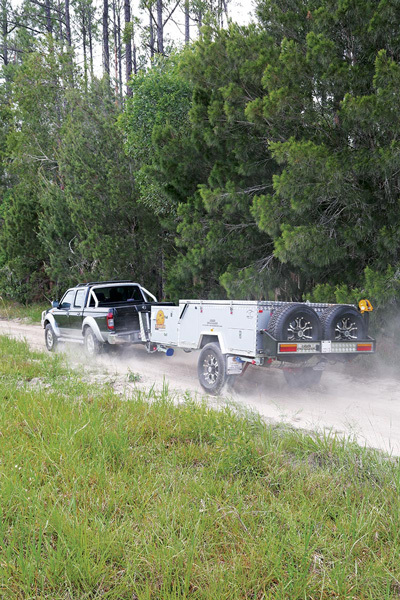 Operating the forward-fold unit is relatively simple and it doesn’t take long to set up or pack up for a quick overnight stop. The main tent area measures 4200x1800mm and the main awning, being 4200x 2200mm, adds more than the same area again to comfortably cover all the catering functions. All windows are protected under awnings and a tropical roof sits above the main roof area. 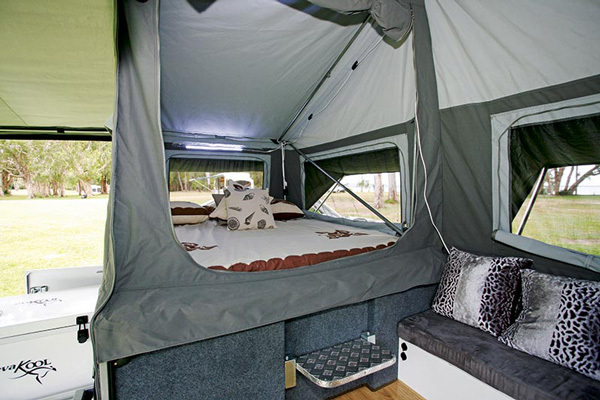 The Jawa Cruzader has a pleasant appearance and layout which is conducive to relaxation. This can likely be attributed to the company’s other core business, which relates to hand-crafted furniture. Opposite the bed, the U-shaped lounge, finished in soft grey microsuede, offers space to stretch back and put the feet up. 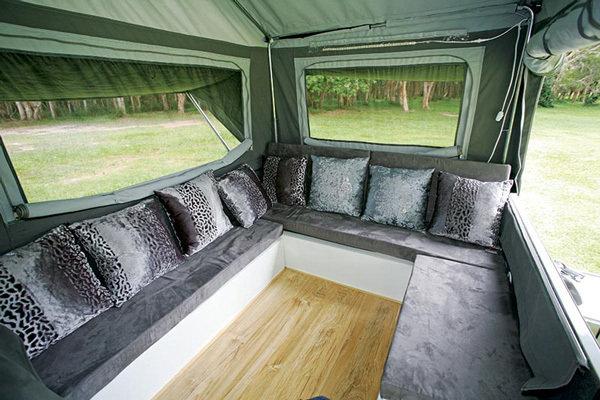 A fold-up table is available if needed and the lounge seating can be made up into a second bed. Like the bedroom, this area has windows all round, including the removable awning side, as well as a wall mounted LED strip light. 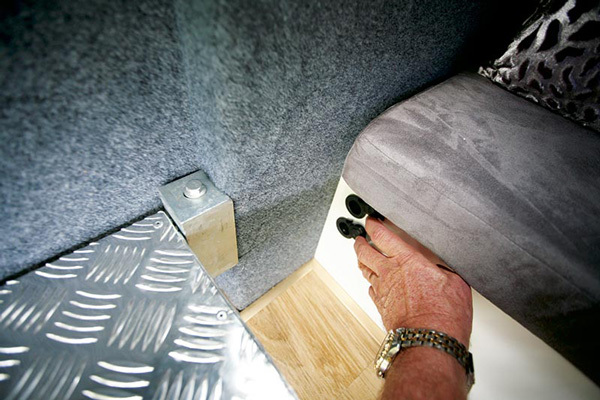 For charging purposes, two 12V outlets are fitted near the bed step. The slide-out kitchen bench has a good size four-burner cooktop alongside a sink and drainer unit. A good size cutlery drawer fits neatly under the cooktop. 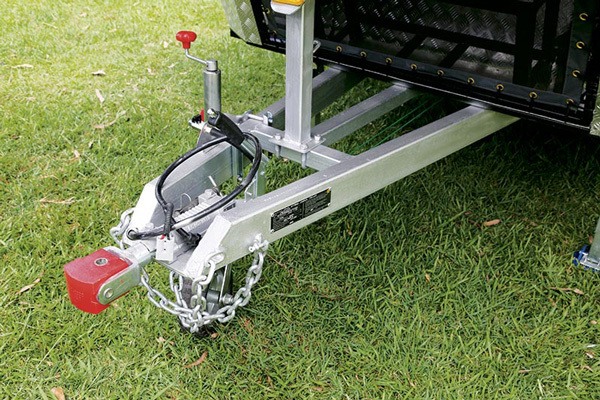 A stalk-style LED light keeps thing illuminated if you’re prepping in the dark and there are both 12V and 5V USB charger outlets on the trailer wall at the end of the kitchen bench. I believe these are essential for RV travel, although I thought these ones were in an strange location. 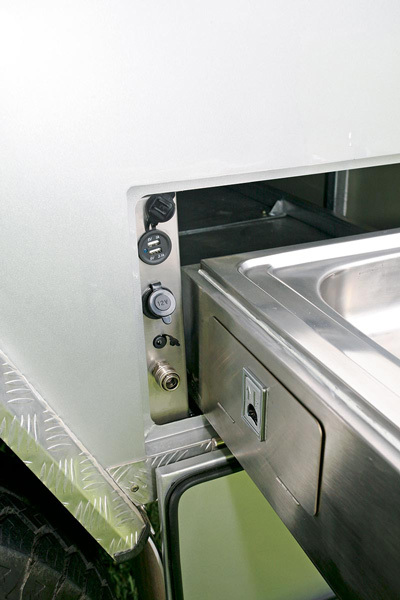 With the fridge located in the front storage box, the kitchen is a practical setup for camper cooks. However, there’s no real bench top space available – either in an extension or on top of the cooktop and sink. At the other end of the camper, in addition to the fridge slide-out, the front storage box contains a good size drawer on the awning side and a slightly smaller but equally useful shelf. On the opposite side, there’s plenty of room for the necessary awning wall storage. 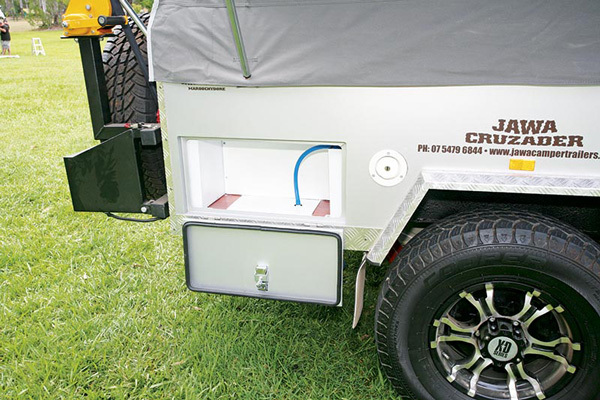 The Jawa Cruzader is a well-appointed camper with just about everything needed for the offroad traveller who’s keen to kick up their heels once they arrive at camp. 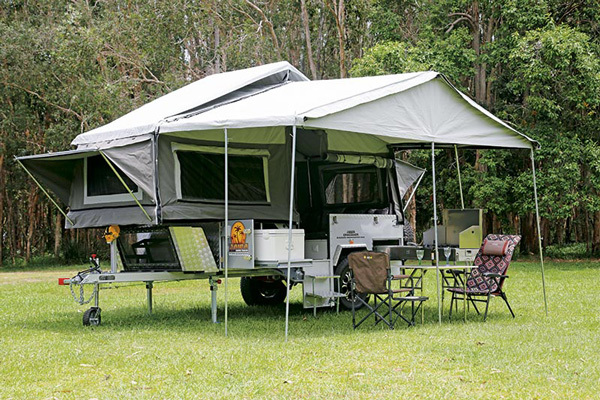 Although appearances aren’t everything, Jawa’s choice decor combined with the Cruzader’s bright and breezy design will no doubt set a relaxing tone for you and your family, wherever you roam.